Let’s get right to it: Why would you replace a perfectly good barrel on a semiauto? The short answer is to improve accuracy or to use reloaded ammo. There is also a third answer, one that takes advantage of the modular nature of modern pistols: to change calibers. 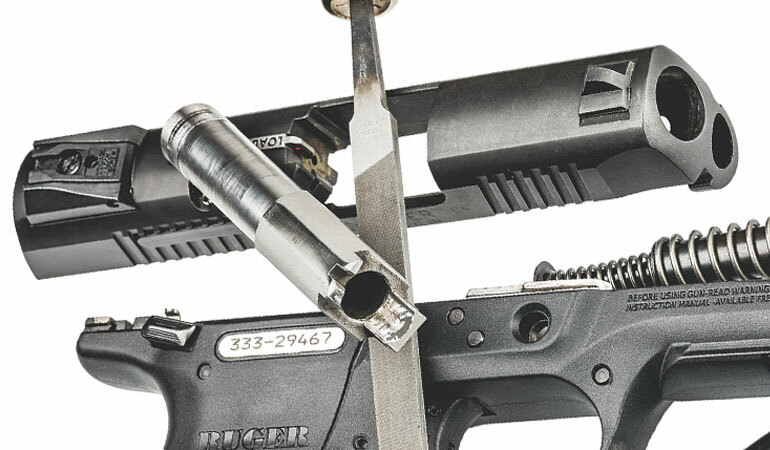 In this article I’m going to look only at barrels for the various polymer-frame pistols or other designs with the same kind of barrel setup: a rectangular hood lug on top that locks in the ejection port and an angled stub underneath—the bottom, or foot, lug. This is the type you’ll find on Glocks, Springfield XD and XD(m) pistols, Ruger’s American, Smith & Wesson M&P and a lot of SIG Sauers. I’m not going to cover 1911s because the fitting process, while easy for the pistols mentioned above, is quite involved and complicated for the 1911 and can’t be covered in the scope of one article. If you fit your barrel with care, you may get better accuracy. And if your gun is a Glock and you’ve replaced the company’s polygonally rifled barrel with a standard-rifled one, you’ll be able to shoot cheaper lead-bullet ammo. Before we get into the how, let’s go back to the why. 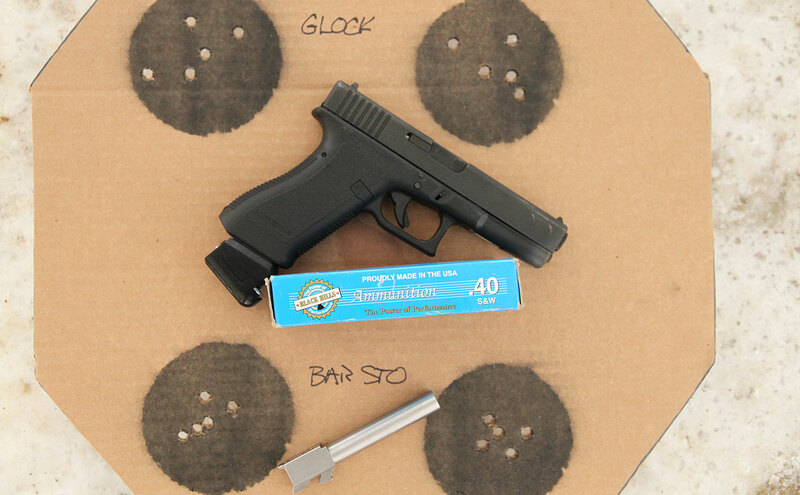 One reason people replace Glock barrels, for instance, is so they can shoot lower-cost ammo in the form of lead bullets—which Glock specifically tells you up front not to use. Glock’s polygonal-rifled barrels lead-up very quickly, and when they do, accuracy rapidly diminishes and pressures rise due to the buildup. But while you shouldn’t use lead bullets in Glock barrels, barrels with traditional rifling are fine with them. So if you want less-expensive practice, fit a replacement barrel. Replacing the factory barrel with one that features cut-groove or button-groove rifling eliminates the problem and allows you to use lead bullets in your Glock. And it may improve accuracy as well. I’ve had more than one person gush over the accuracy of his Glock, but I’ve never seen a tack-driving Glock. With a fitted, match barrel, however, accuracy improves a great deal. And there’s another cost consideration. It is entirely possible to fit a 9mm barrel to a .40 S&W pistol. 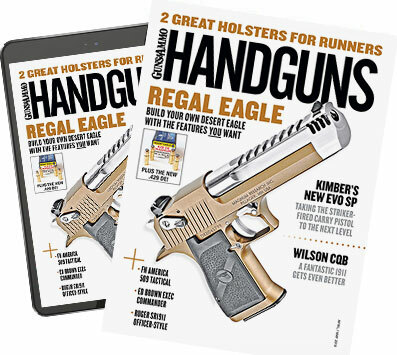 You can practice with your inexpensive reloads and still be able to strip, clean and reassemble your .40 carry gun and load it up before you leave the range. (The other possible change is going from a .40 S&W to a .357 SIG.) You’ve gotten lots of inexpensive practice and not put wear on the .40 barrel and your hands, wrists and elbows. Now, if your practice includes competition shooting, note that this won’t work in some competitions. 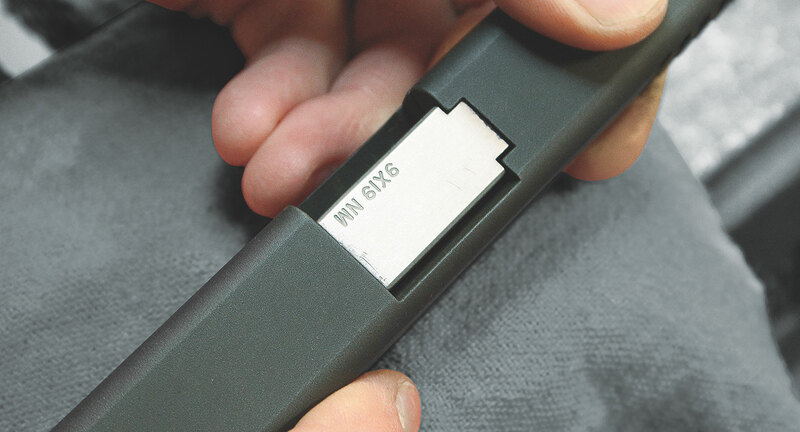 In USPSA and GSSF matches, the caliber on your slide has to match the caliber of your barrel. But as a means of getting in less-expensive practice, this can be a boon. Consider that a replacement 9mm barrel for a G17 from Brownells runs around $150. If you save $50 per 1,000 rounds by reloading or shooting 9mm with lead bullets, your barrel is free after 3,000 practice rounds. Who can resist free? And then there’s the question of overall accuracy. Now, before you go to the expense and time of replacing your barrel, you should’ve done a couple of things. One, you should’ve already tried several brands and types of ammo in the gun. I’m particularly fond of any ammo that uses Hornady XTP bullets, which tend to be accurate out of a lot of pistols. Second, you may have to admit that your skills aren’t to the level that you’re able to wring the best accuracy out of a gun, so you might want to have someone who’s better than you try the gun. But if you’ve tried all that and the gun still isn’t up to your standards, a new barrel may be the way to go. How does a new barrel improve accuracy? Mostly because the custom barrel makers attend to details more closely than the volume producer does. This is not to say that the company that produced your handgun made a bad barrel. Far from it. But when you are making a quarter-million barrels a year for your pistols, you have to be quick about it. The guy who makes 10,000 barrels a year, and only barrels, can sweat the details. First, you need a new barrel for your particular pistol. There are several makers out there, including Bar-Sto, Storm Lake, KKM and Apex Tactical. You’ll also need a padded vise to hold the parts; a clean, sharp, fine-cut file; a dial or digital calipers; and a type of paint called Dykem. 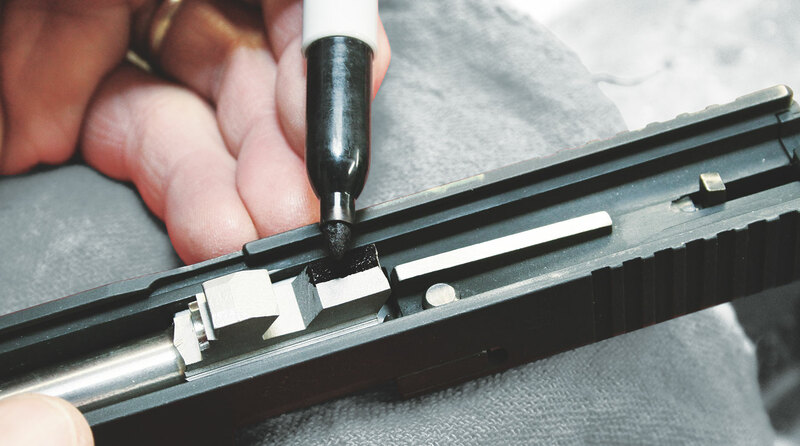 While I recommend Dykem, if you don’t have any and can’t find it locally, you can use a felt-tip pen or a Sharpie to darken the surface you will be filing. First step, unload your pistol and disassemble it. Clean the slide and see if the new barrel fits. If you have bought a “drop-in” and it does fit, your job is done. Assemble the pistol with the new barrel and schedule a range trip to test-fire it. But we’ll assume you bought a barrel that needs fitting. It will slide into the front opening, but the chamber area won’t go into lockup. Now we get down to work. Measure the top of the chamber, the distance from the front surface that locks into the ejection port, to the rear of the hood. Write it down. Now measure the distance from that mating surface in the ejection port to the breech face. That should be less than your barrel measurement. Measure the opening in the slide and the width and length of the barrel hood. Assuming that the barrel hood is larger than the slide gap, file until it’s close (width first, then length). Work on fit next. Before you start filing, measure the width of the hood and compare that to the width of the opening in the slide for it. If the barrel hood is wider, it has to be narrowed to fit. And this comes first, not the hood length. Subtract the slide opening dimension from the hood width. Divide by two. This is how much comes off each side of the hood. While in a 1911 hood width can have a marked effect on accuracy and reliability, on the pistols we’re considering it is pretty much just a pesky detail. However, you don’t want the hood to be too wide; if it is it will cause reliability problems. But once it is narrow enough, your job is done. Just do it right. Clamp the barrel horizontally in the vise, with one side of the hood up. Open the Dykem and brush an even layer on the hood edge. Once the Dykem dries (always let it dry), you’ll have a blue (or red) surface that will show where you’ve filed and where you haven’t. File the barrel hood a bit at a time, taking breaks to measure, re-blacken and approach the desired measurement slowly. There is no need to hurry. Take a pass across the hood edge and see how even you are. 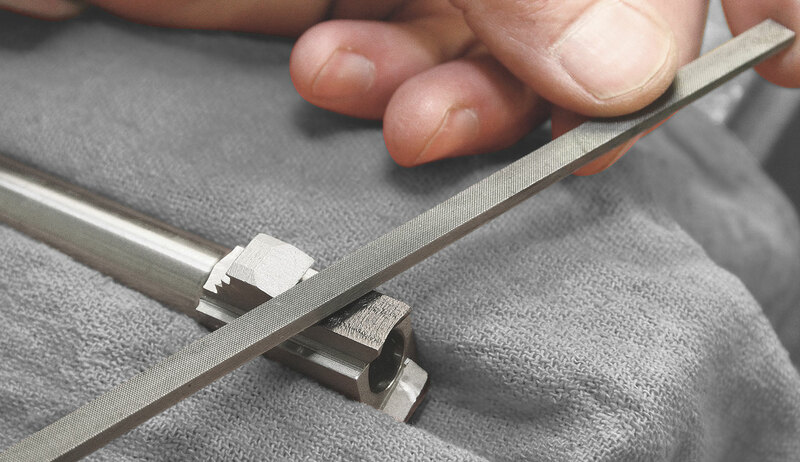 Adjust your angle and hand pressure until you have a clean, full-edge cut. Apply Dykem again and let it dry. Continue, one pass at a time (never back and forth with a file), until you have removed what you need to from that side. Loosen the vise, rotate the barrel, and repeat on the other side of the hood. File only to the exact dimension you need for the hood to be; don’t go over. Your barrel still won’t fit because the hood is too long. Clamp the barrel vertically in the vise. Dykem the end of the hood and begin filing and measuring. 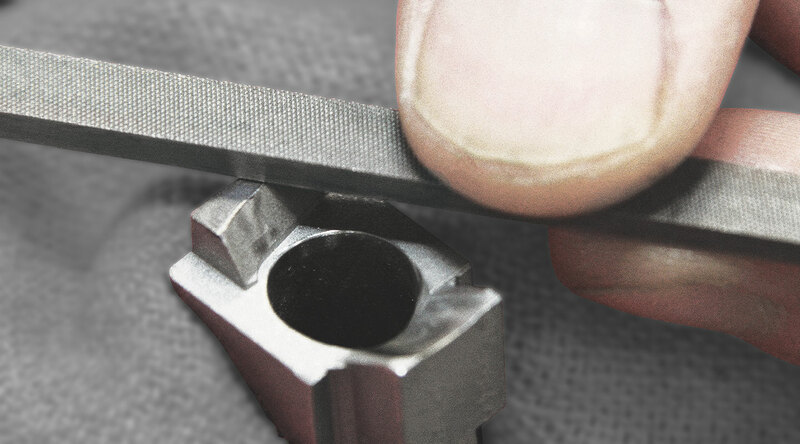 Make every effort to file exactly square to the axis of the bore and to file evenly across the full width of the hood. Dykem is cheap, so slobber it on as you need to in order to make sure you are filing evenly. File until you are a thousandth or two longer than needed. Now the need for patience enters into the picture. 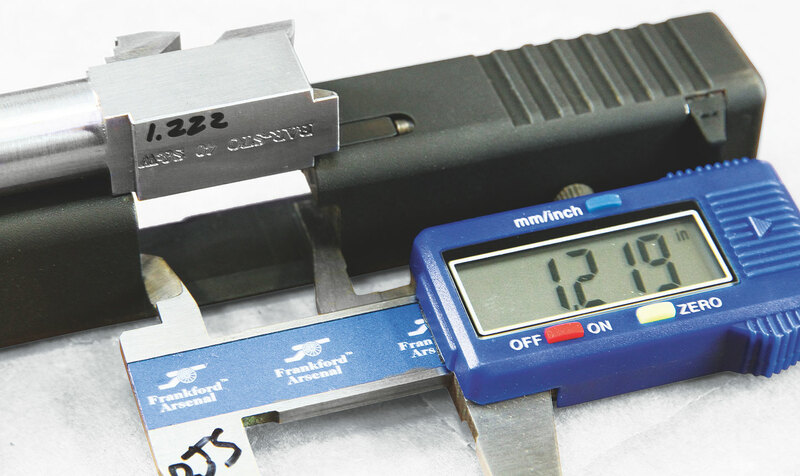 A professional gunsmith with a milling machine would have milled the hood a thousandth under on each side, and a thousandth over on the end, and then jumped right to the hand-fitting. You probably do not have a milling machine and thus had to get here by hand. And you needed a bit of practice in the process for the delicate work to come. Carefully file it, a thousandth or so at a time, until you can force the barrel/slide combo onto the frame. Then blacken again and file where it is rubbing. Dykem the hood on all sides. Slide the barrel into the slide and attempt to press it into place. It won’t go in, but the Dykem will show you where it is binding. File only the bright spots, not the whole surface. Continue applying Dykem and pressing the barrel into place. If you cannot see rub marks in the Dykem (or felt-tip pen) when you press by hand, you can use a rubber or a rawhide mallet. Do not use a ballpeen hammer or any other hard-surfaced hammer. You aren’t trying to force the barrel in at the beginning; you’re just trying to see where it is binding. Carefully file the bright spots, reapply Dykem (or Sharpie) and go again. You’ll reach a point where you can snap the barrel into place and have to whack it from the top with your rawhide mallet to get it to come out. This is good, but you are not done. Inspect closely the pattern of wear through the Dykem on the now hard-fitting barrel. The breech face may not be dead-square to the barrel axis. You make the barrel fit the slide, even if that means you file a bit more off one side than the other. For now, look only at the rear. You’ll see that despite your best efforts, the hood is not bearing on the breech face evenly. That isn’t all your fault, or even mostly your fault (if you filed carefully). That’s the manufacturer’s broaching process, how it cut that breech face, and the breechface is probably a bit uneven. You are now going to make the hood match the slide. Gently file only where the Dykem has been rubbed off. Apply more Dykem, let it dry, and snap the barrel back into the slide. When you get to the point where the fit is tight but isn’t hard enough to require a snap in or out, you’re ready for the next step. On the frame of your polymer-framed pistol, there’s a part called the locking block. The bottom lug of the barrel cams up onto that block and holds it firmly between the frame and slide. That’s your next fit. With the barrel in the slide but without the recoil spring assembly in place, attempt to install the slide onto the frame. It helps to hold the pistol upside-down at this point, so the barrel doesn’t fall out of lockup as you’re trying to check the fit. If the bottom lug is too large, too “tall,” you won’t be able to. If you can force it on, it is time to get out the Dykem again and apply it to the bottom lug, then force the slide and barrel on. Remove the barrel, note the wear in Dykem, and slowly file as you had on the hood. To check bottom lug foot fit, blacken it and then attempt reassembly (without the recoil spring assembly in place). If it doesn’t go together, the foot is too tall and has to be filed down. If you can’t fit the slide on at all, take it off, pull out the barrel and perch it on the locking block in the locked position. Note the surface that cams up and which is too tall. Carefully file, taking a few passes, until you can, as earlier, force the slide/barrel combo on. Then Dykem and proceed as above. Once you can assemble the slide/barrel combo with a bit of force, take out the barrel to deburr it. Use the file to “break” the rear corners of the hood. You just need a small bevel there, nothing extreme, so the corners won’t catch on the slide on the next step. Reapply Dykem to the hood and the bottom lug. Install the barrel and the recoil spring assembly and assemble the pistol. Hand-cycle it a few times to make sure it works when the springs are pushing it. If it does, then you’re off to do some shooting. If not, take it apart and find where it is binding. This is rare, and you may at this point need professional assistance. Take it to the range and put a few rounds through it. It probably won’t function 100 percent, but that is no big deal at this stage. Your next step is to make sure the barrel locks and unlocks freely but does not have extra play. Also, note if the hood is banging on the breech face sidewalls when you fire. If it is, adjust by filing the hood a thousandth or two on the side that shows the impact. What you are seeing is the barrel, held by the opening in the slide, finding its own center in the slide, and the hood dings are collateral damage to the dimensional mismatch. The hood has to have side-to-side clearance, but the barrel wants to stay centered and find its own center, and you do the last step by test-firing it. You also have to make the rear of the hood a smooth fit to the breech face, but firing is better than hand-assembly in testing that fit. Again, file where the Dykem has been worn off and not anyplace else on the rear of the hood. Now, having done this, what can you expect in the way of accuracy? That depends on the state of your ammo and, as mentioned, the state of your shooting skills. It is entirely possible that you could go through all this and see no improvement. If that’s the case, you need to be realistic. If you were shooting, say, six-inch groups at 25 yards before and now are shooting five-inch groups, look at your ammo. Look at your skills. Is your ammo reloaded with random-headstamp brass and the least-expensive bullets to be had at the local gunshop? Five inches might be as good as it gets.